Ask the Professor: Did “Jaws” invent the modern-day Hollywood film franchise? Professor Marc Lapadula: Jaws (1975) changed everything with its happy ending, which was sort of tacked onto the film. Spielberg can be credited, as a director, with actually saving the film business, which at that time was floundering. Spielberg first, and George Lucas two years later with Star Wars (1977), they kind of single-handedly, or as a dynamic duo, rescued the struggling film industry. They also originated the marketing and box office strategies that’s become the norm for tentpole movies today. 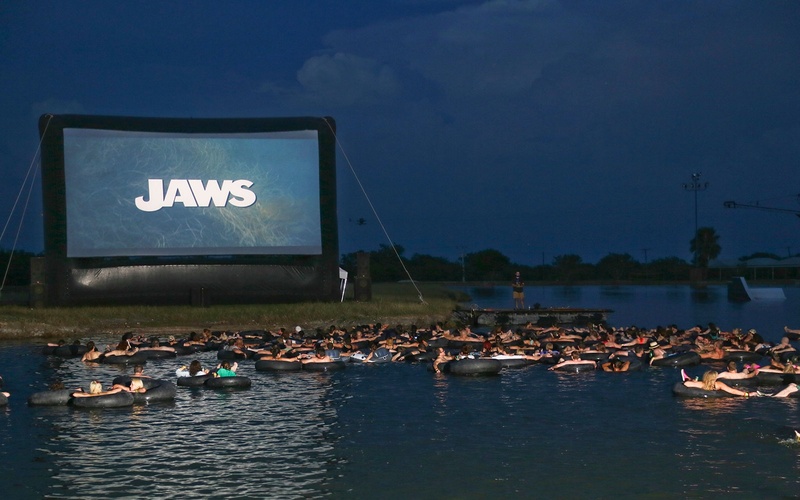 Jaws had a $700,000 marketing strategy (over $3.2 billion in today's dollars), too, hitting all the major networks and primetime the week before this movie came out, so it really built anticipation. Everyone was talking about it before it even came out — they were planning how they would get to the theatre on opening night. People were so excited in anticipation for this Jaws movie. At that time, most movies like The Godfather (1972) opened on six screens; it went on to later was shown on 323 screens and made over $133 million at the U.S. box office — a huge hit. 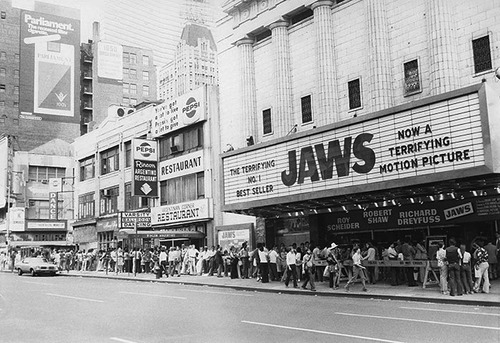 But Jaws opened on 409 screens on June 20, 1975. By July 25, 1975, it's on 675 screens, which at that time was beyond a huge number of screens. (Now I know movies today will open in over 3,000 - 4,000 screens.) It grossed over $260 million in the U.S.
As much as Spielberg and Lucas revitalized cinema, some might say they also killed it. What's so great about the movies of the late 1960s into the mid-to-late 1970s is that they have these downbeat, realistic, tenebrous endings. This all stopped. Because in Jaws, our hero, Brody (Roy Scheider), can't swim. He's lost his glasses. He's gonna drown. He's gonna die. The shark's gonna eat him. The only thing we can hope for is that, before he dies, he can kill the shark. That's the best we can hope for. But at the end of this movie, not only does he kill the shark, but also — he's intact. And Matt Hooper (Richard Dreyfuss), too, is okay. If Jaws had ended tragically — if he killed the shark, but he then drowned — would that have been a movie everybody would have flocked to again and again? They'd have seen it maybe once, and they would have been like, Oh my god, it's just so depressing. But they go again and again because he triumphs. Repeat viewers leads to more ticket sales. If Brody had died at the end, I don't think it would have made the money it made. And because the characters are alive, they could come back for sequels. Spielberg didn't return for the sequel, but the studio tried to turn his brilliant ability for telling narrative into a paradigm that others (who were far less successful or talented) were forced to follow. This was a new thing: by the 1980's, studios were interested in franchises. They were interested in movies that would promote products within the scenes, so you're almost watching commercials. They would pay to have the Coca-Cola bottle in the shot, and if the star drank it or said, "Give me a Coke," you would associate the star with the product you want to endorse. Studios were getting revenue for all that. Then, also, due to these happy endings, people were encouraged to tell their friends, “You gotta see it.” The 1980's changed everything. The movies were not nearly as good, but they were much more successful — financially. Read more from Ask the Professor: Did Jaws Establish the Tyranny of the Happy Ending? Marc Lapadula is a Senior Lecturer in the Film Studies Program at Yale University. He is a playwright, screenwriter and an award-winning film producer. In addition to Yale, Professor Lapadula has taught at Columbia University's Graduate Film School, created the screenwriting programs at both The University of Pennsylvania and Johns Hopkins where he won Outstanding Teaching awards and has lectured on film, playwriting and conducted highly-acclaimed screenwriting seminars all across the country at notable venues like The National Press Club, The Smithsonian Institution, and The New York Historical Society. He has also been an expert script analyst in major Hollywood lawsuits. Ask the Professor: Did “Jaws” establish the tyranny of the happy ending? Ask the Professor: In “Jaws,” how does Spielberg exemplify a new generation of directors? Ask the Professor: How did problems with the mechanical shark in “Jaws” lead to a brilliant moment?